Explore how a CDN works under the hood to deliver fast, efficient and secure delivery of content to websites and Internet services. A properly configured CDN may also help protect websites against some common malicious attacks, such as Distributed Denial of Service (DDOS) attacks. Is a CDN the same as a web host? While a CDN does not host content and can’t replace the need for proper web hosting, it does help cache content at the network edge, which improves website performance. Many websites struggle to have their performance needs met by traditional hosting services, which is why they opt for CDNs. By utilizing caching to reduce hosting bandwidth, helping to prevent interruptions in service, and improving security, CDNs are a popular choice to relieve some of the major pain points that come with traditional web hosting. What are the benefits of using a CDN? Improving website load times - By distributing content closer to website visitors by using a nearby CDN server (among other optimizations), visitors experience faster page loading times. As visitors are more inclined to click away from a slow-loading site, a CDN can reduce bounce rates and increase the amount of time that people spend on the site. In other words, a faster a website means more visitors will stay and stick around longer. Reducing bandwidth costs - Bandwidth consumption costs for website hosting is a primary expense for websites. Through caching and other optimizations, CDNs are able to reduce the amount of data an origin server must provide, thus reducing hosting costs for website owners. Increasing content availability and redundancy - Large amounts of traffic or hardware failures can interrupt normal website function. Thanks to their distributed nature, a CDN can handle more traffic and withstand hardware failure better than many origin servers. Improving website security - A CDN may improve security by providing DDoS mitigation, improvements to security certificates, and other optimizations. At its core, a CDN is a network of servers linked together with the goal of delivering content as quickly, cheaply, reliably, and securely as possible. In order to improve speed and connectivity, a CDN will place servers at the exchange points between different networks. These Internet exchange points (IXPs) are the primary locations where different Internet providers connect in order to provide each other access to traffic originating on their different networks. By having a connection to these high speed and highly interconnected locations, a CDN provider is able to reduce costs and transit times in high speed data delivery. Beyond placement of servers in IXPs, a CDN makes a number of optimizations on standard client/server data transfers. CDNs place Data Centers at strategic locations across the globe, enhance security, and are designed to survive various types of failures and Internet congestion. Latency - How does a CDN improve website load times? The globally distributed nature of a CDN means reduce distance between users and website resources. 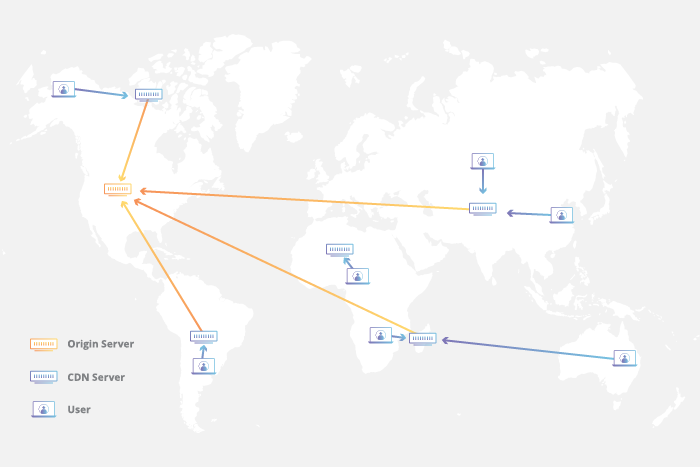 Instead of having to connect to wherever a website’s origin server may live, a CDN lets users connect to a geographically closer data center. Less travel time means faster service. Hardware and software optimizations such as efficient load balancing and solid-state hard drives can help data reach the user faster. CDNs can reduce the amount of data that’s transferred by reducing file sizes using tactics such as minification and file compression. Smaller file sizes mean quicker load times. CDNs can also speed up sites which use TLS/SSL certificates by optimizing connection reuse and enabling TLS false start. Reliability and Redundancy - How does a CDN keep a website always online? Load balancing distributes network traffic evenly across several servers, making it easier to scale rapid boosts in traffic. Intelligent failover provides uninterrupted service even if one or more of the CDN servers go offline due to hardware malfunction; the failover can redistribute the traffic to the other operational servers. In the event that an entire data center is having technical issues, Anycast routing transfers the traffic to another available data center, ensuring that no users lose access to the website. Data Security - How does a CDN protect data? Bandwidth Expense - How does a CDN reduce bandwidth costs? What is a CDN Data Center? What is an Origin Server? What is an Edge Server? While a CDN does not host content and can’t replace the need for proper web hosting, it does help cache content at the network edge, which improves website performance. Many websites struggle to have their performance needs met by traditional hosting services, which is why they opt for CDNs. By utilizing caching to reduce hosting bandwidth, helping to prevent interruptions in service, and improving security, CDNs are a popular choice to relieve some of the major pain points that come with traditional web hosting. At its core, a CDN is a network of servers linked together with the goal of delivering content as quickly, cheaply, reliably, and securely as possible. In order to improve speed and connectivity, a CDN will place servers at the exchange points between different networks. These Internet exchange points (IXPs) are the primary locations where different Internet providers connect in order to provide each other access to traffic originating on their different networks. By having a connection to these high speed and highly interconnected locations, a CDN provider is able to reduce costs and transit times in high speed data delivery.